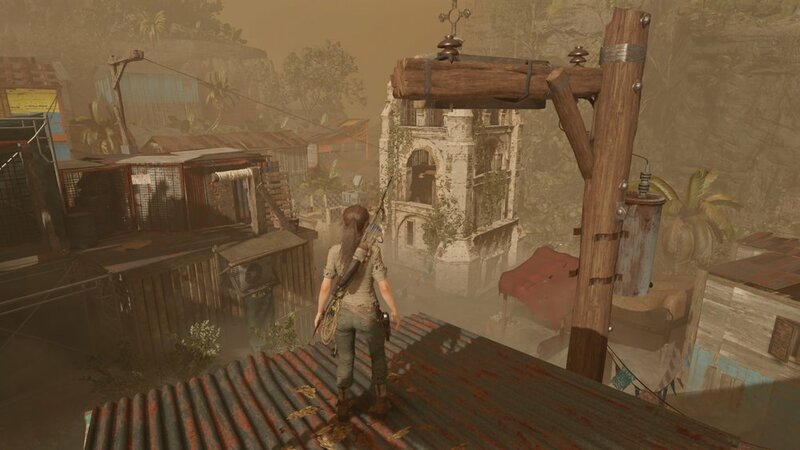 The second to last DLC for Shadow of the Tomb Raider takes Lara back to the recluse of Mission of San Juan. At least one of my wishes for the remaining adds-on got fulfilled as the new mission “The Wrathful God” is post-game content. After talking with Jonah and Abby, Lara’s chronic inability to say “no” once again takes the adventurer into breakneck danger. According to Abby, Zicapna, a god of Earthquakes, is angered because a relic depicting a crab has been stolen by the remaining Trinity troops. You may wonder why it’s such a big deal to Zicapna. Well, as Lara finds out, crab was his favorite food. Be it a coincidence or not, earthquakes are taking its toll on local villagers who want to rebuild part of the town that was destroyed in a mudslide, so it’s of utmost importance that the relic is found and returned to its resting place deep within a new challenge tomb “Zicapna’s Craving”. First, Lara follows a clue to a crypt built for priests of Zipacna, now an excavation site left behind Trinity. It’s dark and rambling, so Lara must get generators up and running to turn on the spotlights to reveal the further way in. Soon, the stolen relic is appropriately found with only a handful of Trinity troops to fight off. How oddly convenient. However, Lara has no time to hold on to that thought as the next part of her journey takes her to the village that was run over by the mudslide in the main campaign. It’s an exciting rush past the rooftops and avoiding falling into wallowing mud below, reminiscent of a pretty similar scene in the Tomb Raider reboot. Once through, Lara finds the temple site and enters the fiery depths of Zicapna’s Craving. A huge caiman statue dominates the space and as soon as Lara enters its premises, an ancient mechanism triggers it to descend. The statue must be raised again for Lara to be able to enter its gaping jaws and that means activating a series of pushing blocks. Less heavy in environmental puzzles, the tomb is all about utilizing Lara’s traversal abilities to the fullest to make it to each trigger. Once the tomb is raided inside the caiman’s head, there’s a secret room to be located where the stolen crab relic belongs to. Up until now, the whole journey has been oddly devoid of enemy activity… Can you spell a t-r-a-p? Ensuing firefight provides a plenty of cover for Lara, making it almost like a shooting gallery, so much to my delight I was able to use the bow as much as I could, only fending off advancing troops with shotgun blasts. When the smoke descends, it’s the usual business of collecting the spoils: a new outfit, a new shotgun and the ability to craft incendiary shotgun shells. I really enjoyed the level design of all the main parts of the mission - the crypt, the village and the tomb – as they were refreshingly different from most of the sights and tombs featured in the previous add-ons and more importantly, put Lara’s traversal abilities to a real test. I also liked how the side mission took place post-game, giving a meaningful challenge to tackle when the main adventure has been seen through. One more DLC to go and Lara’s trip through Shadow of the Tomb Raider is over. I can only hope that Eidos Montreal has something extraordinary in store to finish off the Tomb Raider trilogy in style. If Uncharted rose to fame with weapons it stole from washed-out Tomb Raider (before its reboot), Shadow of the Tomb Raider grabs them back, making it visually and gameplaywise the most essential action-adventure you can imagine. The Forge is a great opening shot for the rest of six DLC adventures to follow, not to mention that it alone is better than the dreary 20th anniversary content released for Rise of the Tomb Raider. I can’t get enough of Shadow of the Tomb Raider, I really can’t, and it couldn’t make me any happier that with The Forge and now The Pillar, the quality curve of the DLC is pointing in a good direction, promising a lot for the five remaining challenge tombs to come!